Just sit right back and you’ll hear a tale, a tale of a fateful trip. 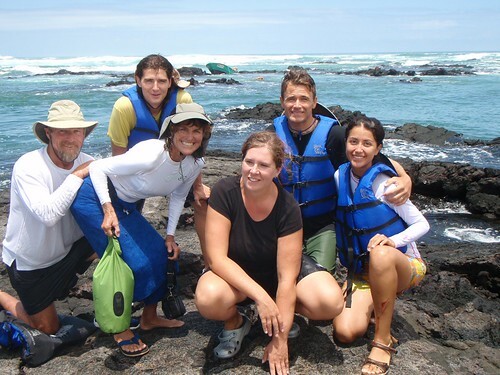 At Isla Isabela in the Galápagos, one of the trips most people recommend is hiring a panga and guide for a snorkelling tour of the lava tunnels at Los Túneles. So, along with our friends Robert and Kelita from Freedom and David and Suzi on Sidewinder, we hired the panga Inmaculata with its captain Miguel and guide Diego to check it out. Six passengers set out that day for a five hour tour. A five hour tour. The panga ride over to the area was very bumpy, as the seas were fairly high and they drive really, really fast. Both Kelita and I were not liking it at all, and we all agreed that a slow ride on a sailboat is preferable. However, as the site is a good distance from Puerto Villamil, a fast boat is the only option. We arrived at the entrance to the area after about an hour, and saw that we would have to negotiate breakers to gain entrance to the spot. We had heard that getting in was an impressive experience, and could easily see that it would be the case. There was some debate about whether or not conditions were good for going in to the site, but the majority of us onboard wanted to give it a try, and the captain was prepared to go ahead also, so we headed around outside the breaking waves to get a proper angle of approach. On the way we saw a giant ray, well over a metre wide. We followed it around for a while, oohing and ahhing at its majesty. Eventually, it swam off and we went to try our approach to Los Túneles. The waves near the reefs were about 10 to 12 feet tall, breaking and rolling like good surfing waves. The captain gunned the engine, and we went in between two waves driving along the face. At one point we all realized that there was a reef on our left and a wave on our right, and something had to change. Unfortunately, nothing changed fast enough, and we were hit broadside by a big breaker. Of course, the panga rolled over immediately. On board, we all knew what was going to happen a split second before it did, so we were all kind of prepared for it — some people grabbed on to the bars which held the boat’s bimini on, others just hunkered down low to try and take the roll as easily as possible. As the boat rolled and filled with water, Suzi and I, who were on the low side, were thrown back into the bimini bars, and had to find our way through the bars to swim out. It sounds hard, but both of us did it automatically and were well away from the upside down boat very soon. The men all were thrown from the high side when the boat flipped, and Kelita made her way out from under the boat last. Robert and David are both surfers, and I heard Robert shout for us to swim away from the boat. I turned and saw more breaking waves coming, and remembered to dive under when they broke over me as I swam to the nearby reef. Soon, we were all at the reef, and those who first made it on to the sharp lava helped the others up. Both Steven and I had managed to keep our crocs shoes on, and so we did most of the walking around as the others were shoeless at first and the reef was very uncomfortable on bare feet. We all got on to the reef and took stock of our situation. I had banged my left arm on the bimini bars, and Suzi had hit her neck, but was okay. Most of us had cuts from the reef, but otherwise we were all unharmed. The panga was upside down in the breaking swells, slowly coming in to the reef. Most of our belongings were floating in the water, also heading in to where we were. We set about collecting as much of our stuff as we could, and soon had several bags up on the reef. However, the tide was rising, and after our carefully acquired items nearly washed away again a couple of times, we agreed to head further in toward higher ground. Steven and I each took a couple of bags, and swam to the next set of reefs, then climbed up. The others followed and soon we had everyone and everything on the higher reefs. By now some shoes had been found, and most of us had something on our feet to protect us. Now that we were all safe, the captain and guide turned their attention to the panga. They and the men from our group slowly worked to bring the boat through the reefs and in toward where we were camped out. They got in close and tried to right the boat, but it was too heavy. David suggest tying the painter to the middle of the boat, and they ran the line up to where I, Kelita and Suzi were on shore. I looped the line around a lump on the lava rock to keep it from pulling us off the reef in our attempts, and with the guide at the end of the line, all three women hauled on the line as the men pushed on the boat. Timing our efforts for when a wave would lift the boat, we finally got the boat righted after what felt like a long time of trying. With the boat right side up we could see the damage it had suffered: the only evidence that there had ever been an upright steering station was a couple of broken cables flopping around, the bimini had been completely sheared off and the covers on both motors were lost. Otherwise, the hull was okay. However, there was no way to get it to open water, so we had to leave it tied to a corner of the reef. At this point, our guide, Diego, set off to try and find another tour boat to take us back to Puerto Villamil. Shortly he returned, letting us know that a boat was coming. We spent our time waiting by collecting more of our stuff as it floated in, and rationing the fresh water we’d managed to save. We were very glad to see the other panga pull up with its captain, young helper and passengers of three young French guys, who very gracefully helped us. However, our ordeal was far from over. We couldn’t just drive out of the area we were in with the now twelve of us on board the panga. So, we wound our way through the lava tunnels, sometimes almost portaging the boat over shallow areas, until we got to a spot where the eight of us from Inmaculata could walk to another spot where we could be picked up. A sport fishing boat also come along, and offered to take some of our gear to reduce the weight. We passed one of our bags over to them, and Freedom did the same. Then we set out on a walk over the lava tunnels that most tourists will never see. Following Miguel and Diego, we walked over some very interesting lava formations, heading what appeared to be nowhere. At one point we came across a lagoon, and had to swim to the other side. We were starting to wonder if we were going in the right direction as we could see nothing ahead. Finally, we came to a break in the plants and could see the ocean on the other side. And there was the boat with its French tourists waiting! We had to swim to the boat, and as we approached one of the French guys pointed at us and said, “They have funny looking seals here. They’re wearing hats.” At the time, this was hilarious. We climbed aboard, and the captain began to head toward the breaking waves to take us out. We started to get nervous as we approached the breakers, and silently lifejackets were handed around and donned. No one spoke as the captain gunned the engine to start our approach to the breaking waves. No one even spoke when we immediately hit a rock. We didn’t know what to say when a few minutes later one of the motors stalled. Undaunted, the captain restarted the motor, gunned both engines again and charged up the face of a towering wave. It seemed to take forever to crest the wave and run up the next one, but it was probably all over in about five minutes. We were through the breakers, in safe water and headed back to Puerto Villamil. The ride back to the anchorage was long and bumpy, but we were all just happy to be headed home. Unfortunately, we had a few more challenges to surmount. When we pulled into the anchorage, we asked if we could be dropped off at the main dock, where we’d find a ride back to our boats with some other cruiser. We knew from experience that getting from panga to sailboat was tricky in that anchorage, but we were told that the Port Captain’s rules meant that they couldn’t take us to the dock since we hadn’t left from the dock. Reluctantly we agreed to be dropped off at our boats, and we made for Sidewinder first. As we approached, the panga nearly collided with one of their solar panels, and after a few attempts David and Suzi scrambled aboard their boat. We then headed to Freedom, where Steven and I decided we’d disembark, then get a ride to Scream from Robert and Kelita later. As we approached Freedom‘s stern, the panga all of a sudden sped up and rammed Freedom abeam. The boat then drove straight over the painter line tying Freedom‘s dinghy to their boat. The painter got caught in the props of the panga and we untied the painter and scrambled aboard Freedom, with a fair amount of angry shouting, I’ll admit. Then we saw that the captain of the panga was holding the throttle for one of his motors in his hand, several feet away from the motor it belonged to. The throttle had broken off in the on position as we’d approached Freedom, and luckily the run in with the dinghy painter had stopped the motors. They motored away on their remaining engine, and shortly thereafter the sport fishing boat arrived with our stuff. Nervous about them getting too close, we had them toss the bags to us, and of course ours ended up in the drink. Everything had spent a long time in the water anyway, so that was no matter and we waved them off as Steven dove in to rescue our bag. We had a moment of respite on Freedom before getting a ride with David from Sidewinder back to our boat. The next day we saw Inmaculata being towed back to port past our boat, its hull intact if a bit battered. All in all, quite the experience. But we never even got the change to make a radio out of a coconut. glad you are well, alive, and have not yet caught some nasty tropical disease. sounds like an exciting book to follow this giant sailing adventure of yours. some salty sailing terms that need to be looked up. the yotrep has had you stuck out in the ocean for quite a long time, it used to be so very reliable.